Posted on February 28, 2018. Interview Series, Latest News. Little Wings is a small not-for-profit with a huge heart. Based in Bankstown Airport in Sydney, the charity provides flights and transport services to regional children needing medical treatment across the Sydney and Newcastle hospital networks. 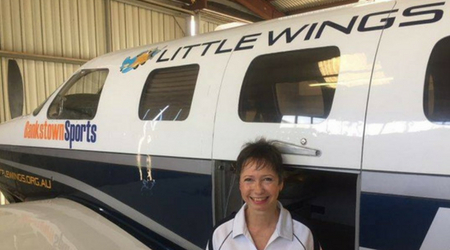 Business development professional, Claudia Steiner, joined Little Wings in September last year from the corporate sector. And she hasn’t looked back. We talk to her about her first six months transitioning into the role, the fundraising challenges she’s faced and the priorities for Little Wings into 2018. You’ve been business development manager for Little Wings since September last year. What attracted you to the role and how have you found your first six months? From a very young age, I’d always wanted to work in the not-for-profit sector but for one reason or another went on to build a successful career in the private sector. Another dream of mine as a child was to become a pilot and I love flying. So when I saw this opportunity come up I knew I had to apply. Not only that, but I’ve also had personal experiences of travelling with a child in our family long distances for medical treatment. Six months in and the role does not disappoint. My experiences so far have been fantastic. Everyone I work with is dedicated to making a difference to the lives of children in need, one family at a time. What’s the vision for Little Wings? We currently operate out of Bankstown Airport with just one plane and a great team of volunteers. Long term we’re hoping to expand our services to include a base in Newcastle, where we currently work closely with John Hunter Hospital and whose needs are steadily increasing for our service. Ideally, we really need more planes in order to meet the demand. Our ultimate aim for Little Wings is to grow our services nationally as our business model lends itself to this requirement. What are your responsibilities as business development manager? To bring in the money! I’m responsible for identifying and securing new business development opportunities such as liaising with our corporate donors, securing new corporate sponsorships and continuing to grow this revenue base. I’m heavily involved with our community engagement projects and assist with the application process. Little Wings is lucky to have a fantastic board and we all work closely together to shape our fundraising strategies. Our biggest challenge is Little Wings’ brand awareness, as we’re still a relatively young charity. Not being a well-known charity can make it harder for us to get our foot in the door with large corporates who sometimes prefer to be associated with national well known not-for-profits. Having said that, we have a great support from our foundation partner Clubs NSW, and Hyundai who supplies us with our ground transport vehicles. This makes a huge difference to our families. From a career point of view, how have you found the transition into the NFP sector coming from various corporate sales roles? It’s been very grounding and very satisfying. We’re only a small team with a very small office in the back of our airplane hangar in Bankstown Airport. So when you get to meet the parents and their children, we really get to appreciate how valuable our services are, it’s an amazing motivator to fundraise that little bit harder. It’s very rewarding to know that the $20,000 we might raise one week is financing another fifteen flights the next. What top three qualities do you need to have as a successful fundraiser? Persistence, resilience and great research skills. With my corporate sponsorship work, I always do my research and always aim for the top. And I don’t email, I pick up the phone. Being well-prepared and confident often delivers results. What are the priorities for Little Wings in 2018? We’ve been extremely fortunate to receive a significant donation from the Commonwealth Bank of Australia Staff Community Fund to help us upgrade our current plane. So this is a major priority for us this year. We are also focused on growing our corporate sponsors, formalising our events calendar and developing more resources to support these areas. How did you first come across NGO Recruitment and how would you describe your experience? I saw the job advertised on Ethical Jobs, applied and then had an amazing call with NGO Recruitment senior consultant Debbie Jardine. Debbie is a standout recruiter – and I’ve dealt with many in my time. Her advice and follow-up was incredible. Thank you for your time Claudia.